This area contains the last available versions of Poweramp v2 for regular ARM processors (note: Intel devices had their own separate download area). Note: Poweramp v2 is now considered a legacy product for users of Android 4.4 and below only. There will be no further active development of this version. 584: fixed couple of minor issues @ Android 6.0 583: fixed tag editing on SD card @ Android 6.0 583: fixed issue which prevented some skins from loading on Sony devices @ Android 5.0+ 582: fixed issue with seekbar @ Android 6 581: enabled skinned Menu options on Android 5/M-preview 581: Greek win-1259/iso-8859-7 tag encoding option 581: fixed album art selection from gallery If for any reason you have problems when you install the latest build, you can re-download recent older versions from one of the other links. 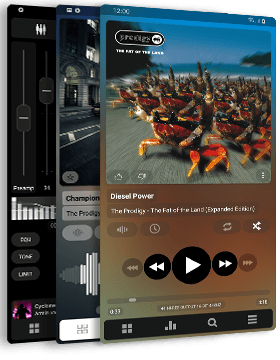 Poweramp 2.0.10 (build 582) for standard (ARM-based) Android devices. 582: fixed issue with seekbar @ Android 6 If for any reason you have problems when you install the latest build, you can re-download recent older versions from one of the other links. Poweramp 2.0.10 (build 581) for standard (ARM-based) Android devices. 581: enabled skinned Menu options on Android 5/M-preview 581: Greek win-1259/iso-8859-7 tag encoding option 581: fixed album art selection from gallery If for any reason you have problems when you install the latest build, you can re-download recent older versions from one of the other links. 580: fixed crash on M-preview 580: few other minor fixes If for any reason you have problems when you install the latest build, you can re-download recent older versions from one of the other links.